Upon graduating with a BFA from Brooklyn College, Mr. Hadley started the domestic Legal division of Wells Management Systems, an International executive search organization.  In 1968 Robert Hadley established Robert Hadley Associates, Inc., a specialized search agency dedicated to the demands of the legal community. Robert Hadley has been a guest speaker on various shows, including the radio station WBLS and Dr. Bernard Meltzer's talk show where he discussed both minority opportunities as well as career potential in and for the legal community. Mr. Hadley has had numerous articles written about him by the media, including the New York Times and New York Post, describing how to interview and the do's and don'ts of a successful job search. With over 40 years of recruiting experience, he brings with him a keen sense of humor and an astute sensibility into the mechanics of success. His complete understanding of the legal industry, and its complex patterns of growth and expansion, make him a leader in the field. Donna M. Buro comes to Robert Hadley Associates with extensive law firm and recruiting experience. She is deeply invested in her clients and candidates, working with a genuine desire to see both parties grow and succeed. While attending Montclair State University pursuing her Bachelor's Degree in Business, she worked as a Legal Administrator for a large New Jersey based law firm. In 1992, she moved her professional career to New York City’s #1 Legal Recruiting Staffing Agency, Robert Hadley Associates becoming the Director of their Legal Support & Paralegal Divisions. In March of 2014, Donna was named President of Robert Hadley Associates. She is an expert at identifying, evaluating and recruiting top-notch talent for her clients. She has a complete understanding of various cultures within a law firm as well as the many difficult and complicated facets of day-to-day law firm management. Donna oversees, manages and leads a full team of legal recruiters as well as our Marketing and Research Division, together expertly matching top talent with the nation’s leading law firms and companies. Personal and motivated, she has developed an individualized approach to management and recruiting, assisting professionals in developing their strengths and finding the roles and talent that enable them to reach their goals. Amanda P. Weintraub is Vice President of Legal Support Staffing at Robert Hadley Associates. As a native New Yorker and graduate of Skidmore College, Amanda joined Robert Hadley eight years ago and provides an expertise in professional development and legal recruitment. Amanda is a proactive, detail-oriented recruiter with a focus on understanding the long term goals of both potential employers and candidates.